Although we trade very differently, I am quite a fan of Al Brooks first book, "Reading Price Charts Bar by Bar". 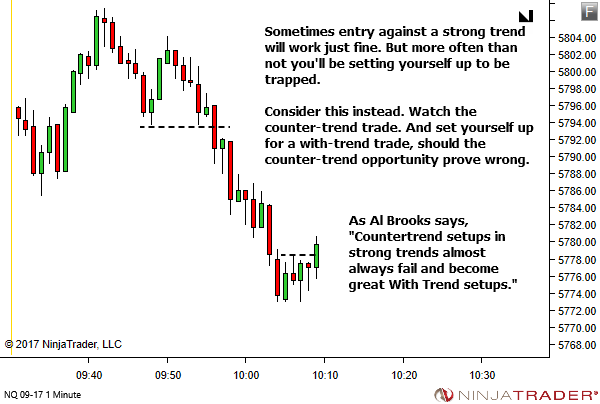 Countertrend setups in strong trends almost always fail and become great With Trend setups. 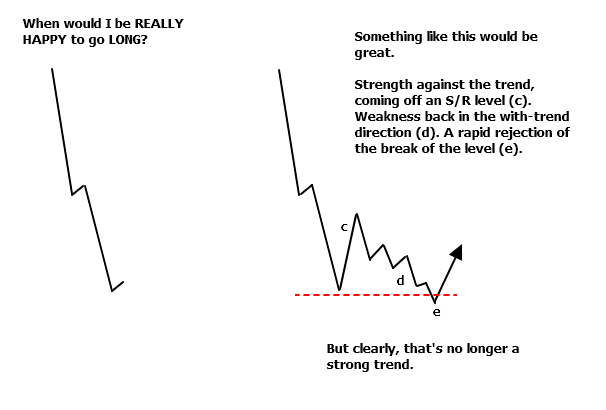 This quote came to mind earlier in the week, as I took a counter-trend entry against a strong trend, despite my predominant thought prior to entry being "This is too obvious. It has to be a trap!". The drop from point 2 was just over 30pts (120 ticks) in 15 minutes. Ok, it's maybe not the strongest trend. 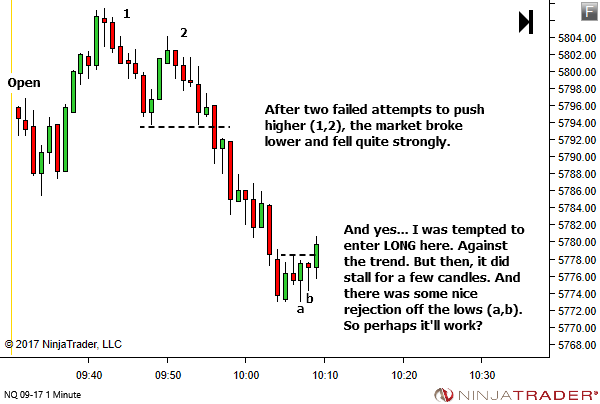 But there was very little opportunity in the way of pullback entries SHORT. And bears still felt in control. And that's when the Al Brooks quote came to mind. Was there any HTF Support where you went long? 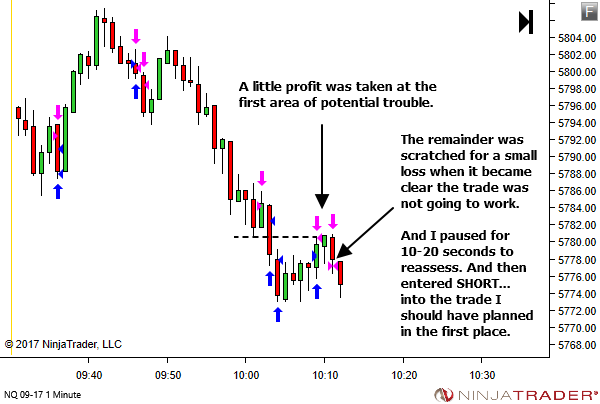 There was but it was still below price action. Price was close but hadn’t quite reached there yet. I left it out of the article so as to focus on one major point only (don’t fade strong moves) rather than adding additional complexity. I’ll address it here though, since you asked. 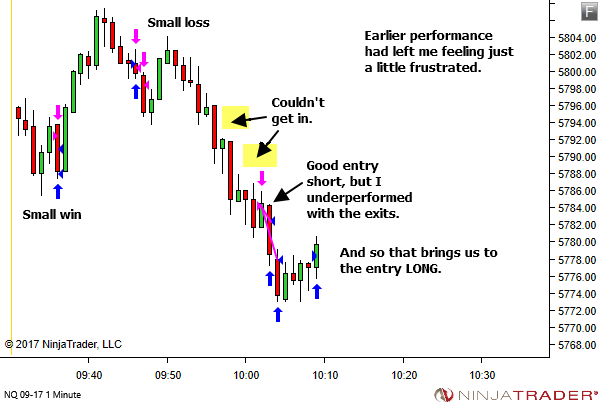 It did also influence my decision to go LONG. However, given the strength of the move, I should NOT have been playing a TST setup. YTC PAT says to wait for the break and then play for either BOF or BPB opportunity. 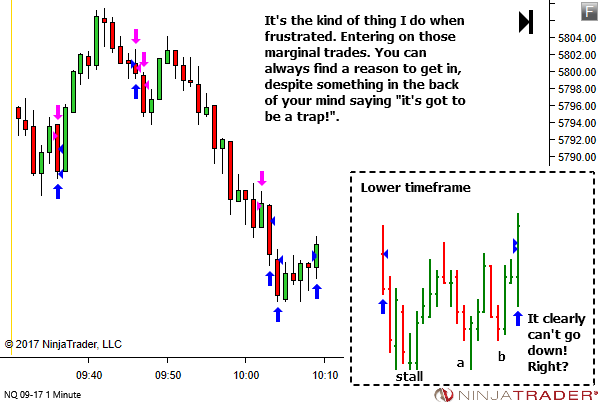 So the right move was still standing aside; watching the LONG for a trap and using it’s failure to enter SHORT for another leg pushing lower towards support (and hopefully breaking the level and continuing lower, as did occur). Thanks for another great post. For some reason, I usually find myself trying to catch tops or bottoms instead of going with the flow.This gives a fresh perspective. Thanks Ekele. I’m glad you enjoyed the post. And you’re certainly not alone in trying to catch the tops and bottoms. It’s a constant challenge for me as well. I’m not sure what you mean by “limits at the money”. Are you just dropping a limit buy at the ask or limit sell at the bid? In any case, no fills, partial fills or slippage are a part of the game. 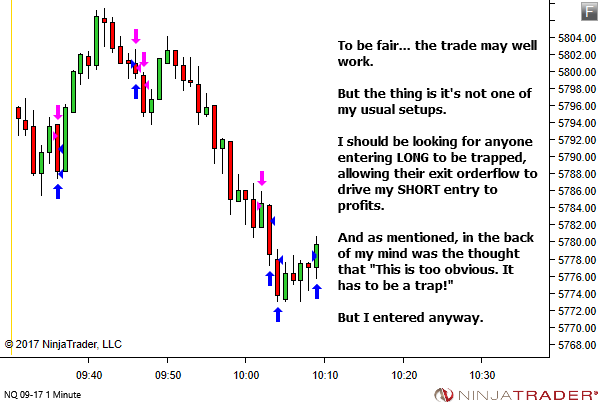 The majority of my trades (maybe 95%) are entered via some type of limit order (either a LIMIT or a STOP LIMIT). This is because I prefer to have control over the price I enter the market. The risk of course is either no fill or a partial fill. I much prefer that to slippage. A smaller percentage (maybe 5%) of my trades are entered via a STOP MARKET order. This is only when I absolutely want to be in the market and are willing to accept slippage. I don’t recall the last time I used a straight MARKET order. So the thing is (as I’m sure you’re aware) there is a downside to all order types. The LIMIT and it’s variations will always risk no fill or a partial fill. The MARKET and it’s variations risk slippage. It’s a matter of you choosing which downside you’re willing to accept. That being said, have a look at the Time & Sales to get a feel for the typical order sizes that transact in the market. If your order sizes are in the same ballpark then you shouldn’t be having too much of a problem. Occasional no fills or slippage, but mostly ok.
And if your entry fills are consistently poor then I highly recommend contacting your broker. They certainly shouldn’t be every trade. 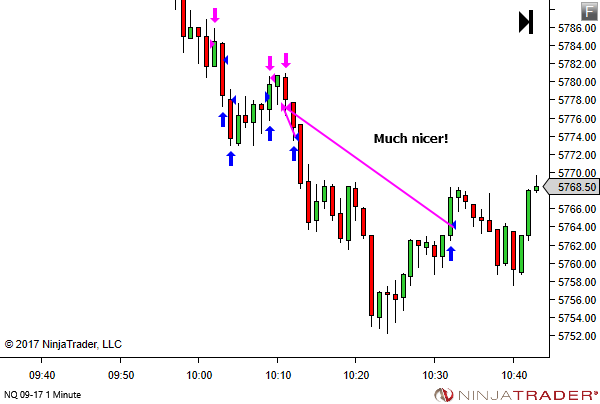 And certainly not more than a tick or two, assuming you’re trading in the liquid part of the day. I’ve no idea what it’s like outside of RTH.